How much money are you willing to pay for a desk? I imagine there’s a spectrum from $0 to Kardashian amounts of cash that most of us are willing to spend. It probably depends on the type of desk, personal philosophies on money, and the current financial situation of the buyer. I’ll admit, I am on the lower side of the spectrum. At the moment, I couldn’t imagine spending more than $100, although I can imagine a future me that has money to burn being willing to spend a couple hundred. However, even in my ideal imaginary daydream where future me is a billionaire with more money then I know how to spend, I can't imagine spending more than $1000 for a desk. 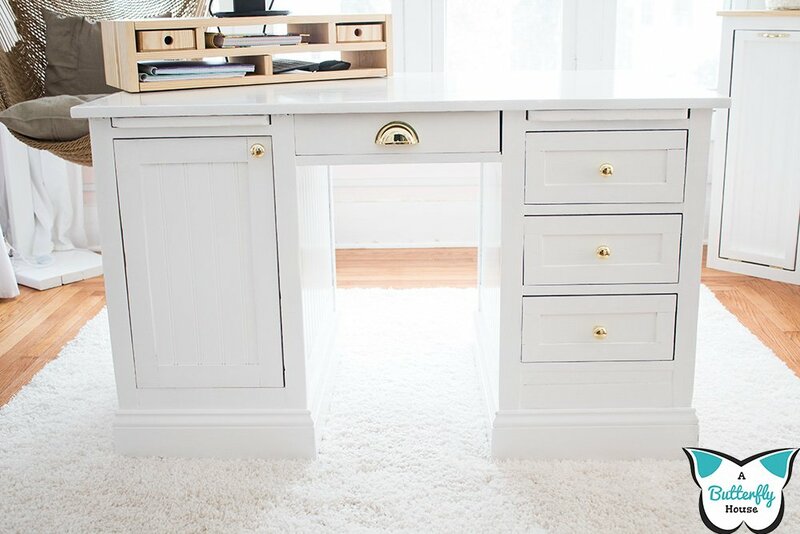 I just can’t think of reason why a $1000 desk would be necessary, when there are plenty of beautiful, high quality desks for under that amount. And yet, Pottery Barn exists. With all of it's beautiful, $1000+ desks that someone must actually buy and the rest of us just covet. 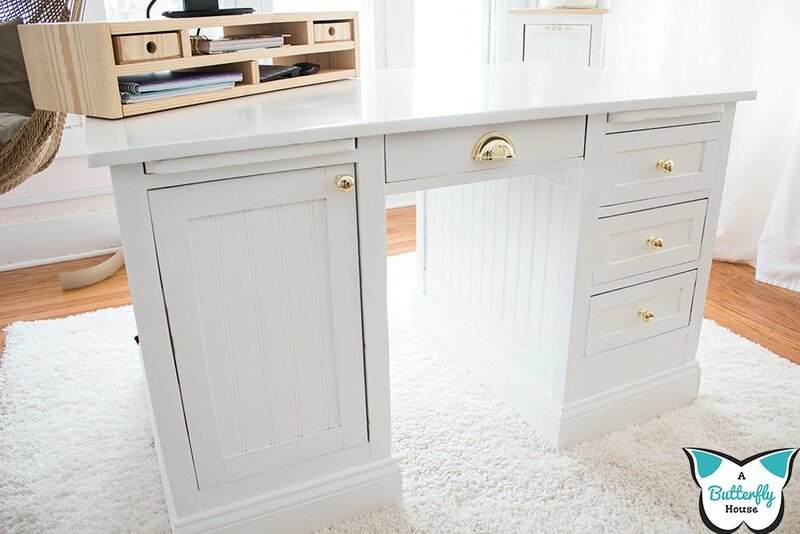 So this week, I set out to recreate a desk I saw on Pottery Barn (specifically, the Aubrey Desk,) but with my $100 budget in mind. 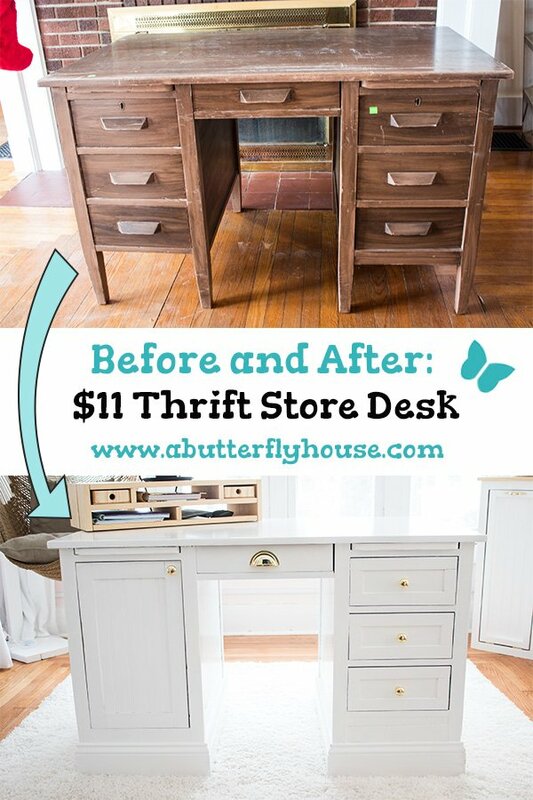 I started with a nice and sturdy $11.75 desk I found at the Habitat for Humanity Restore. 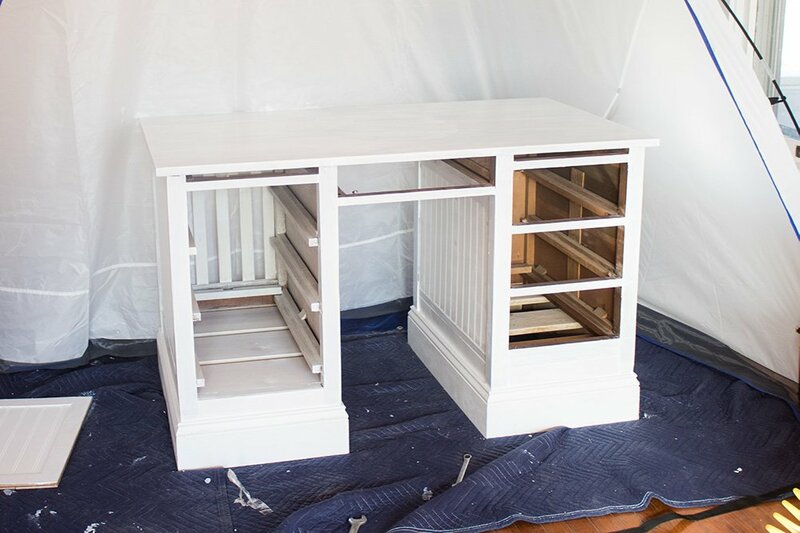 Yes, this desk transformation happened in my living room. It was super cold outside, so the porch and garage were out, and there was no way I was going to be able to get this thing into the basement myself. 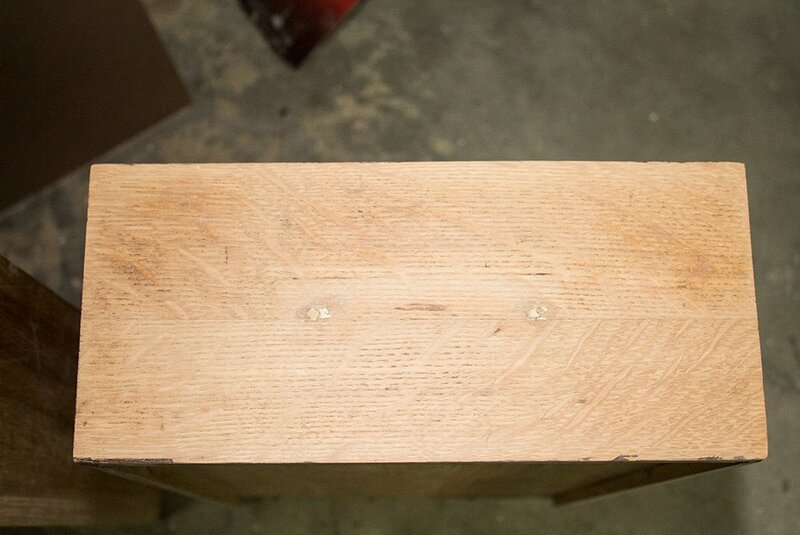 If I need a furniture piece, I always try to transform an existing piece rather than build a new one myself. It is A) easier, B) significantly cheaper, and C) better for the environment. 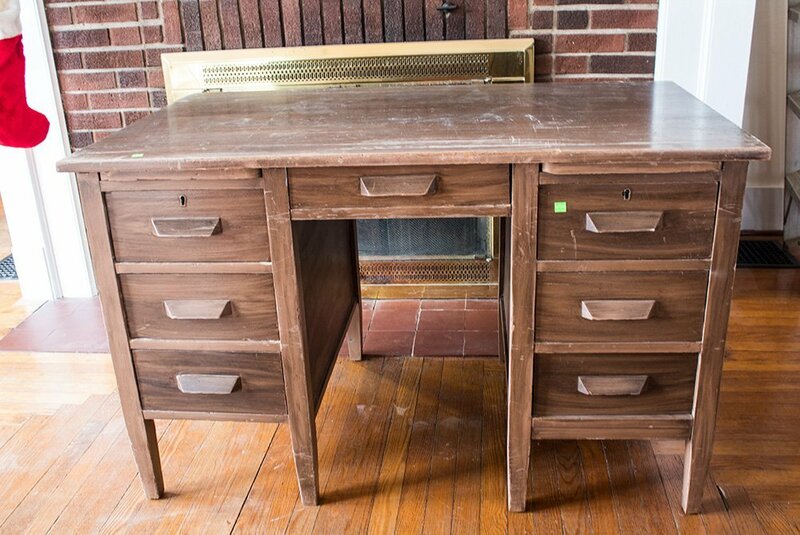 I can't always find what I'm looking for, but I got lucky this time and found this desk after only three trips to Habitat. 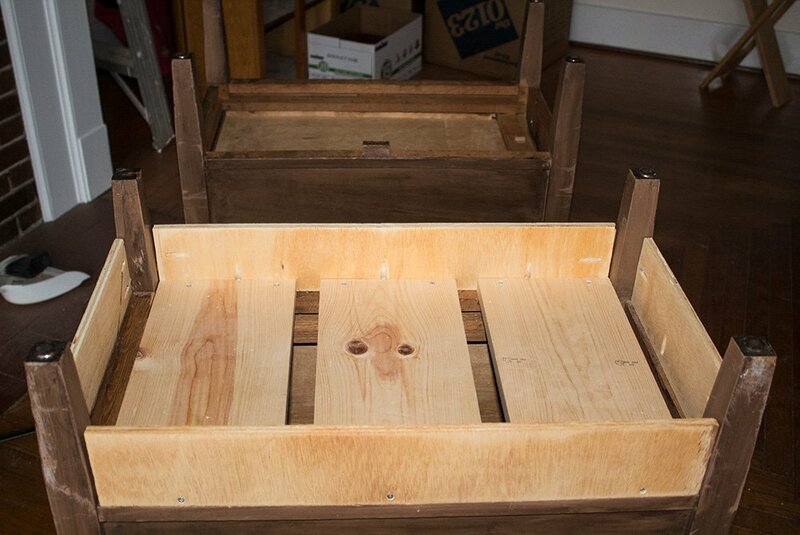 It checked all my boxes of 1) medium sized, 2) made of wood, 3) fixable if broken, and 4) under $50. I purchased it as soon as I saw it. 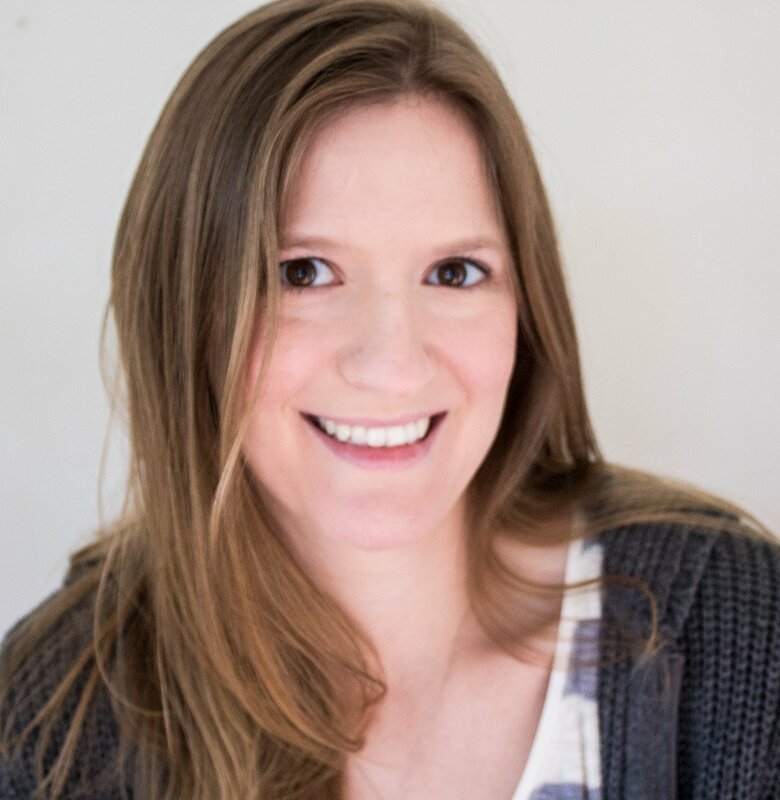 If you're interested in my Thrift Store Furniture Checklist, which helps you pick out quality used pieces, click below! 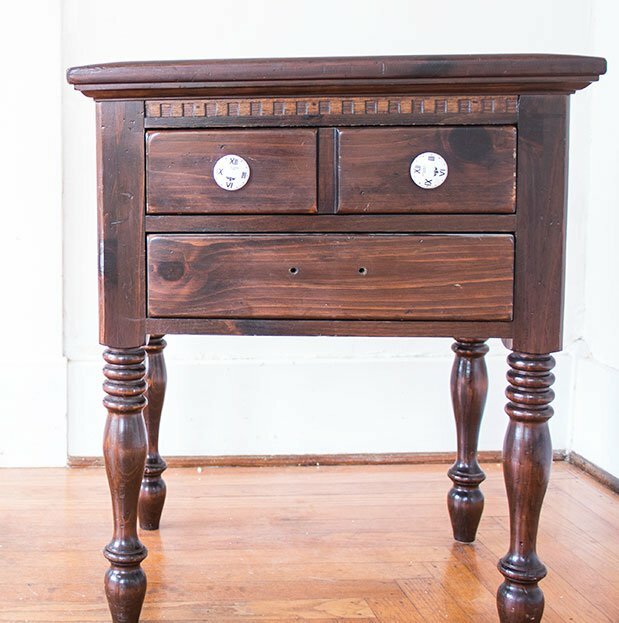 Since I had plans to store a computer in this desk, in addition to the just changing the outward appearance, I need to convert one of the sides of drawers into a cabinet space. I decided to start with that, then work on the aesthetics of the piece once the structural components were complete. 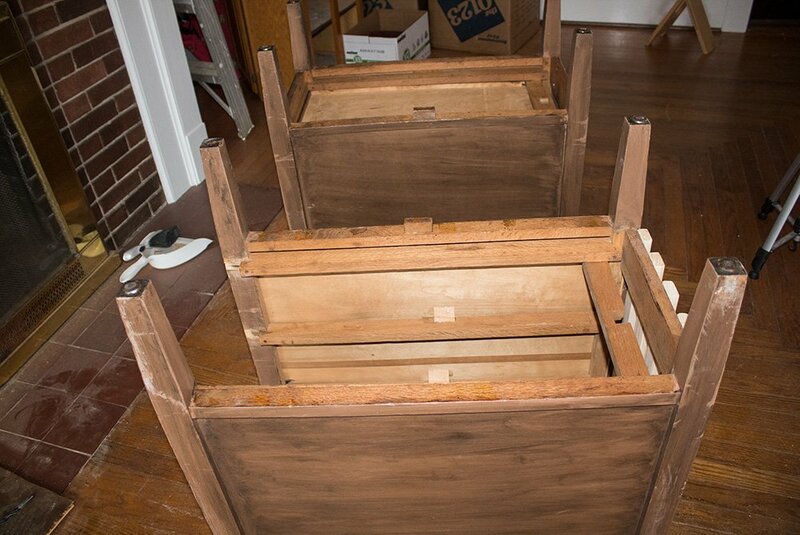 I started by taking out all the drawers on the left side, and cutting out the front dividers with my jigsaw. For those of you that are considering doing a similar project, know that getting started is the very hardest part, and I sat there nervously for about 5 minutes before actually being brave enough to start cutting. Since the computer I'm going to store in the space is pretty heavy duty and creates a whole lot of hot air, I decided to remove the back panel so that the space had some ventilation. I drilled holes in each of the four corners, then cut out the panel with a jigsaw. 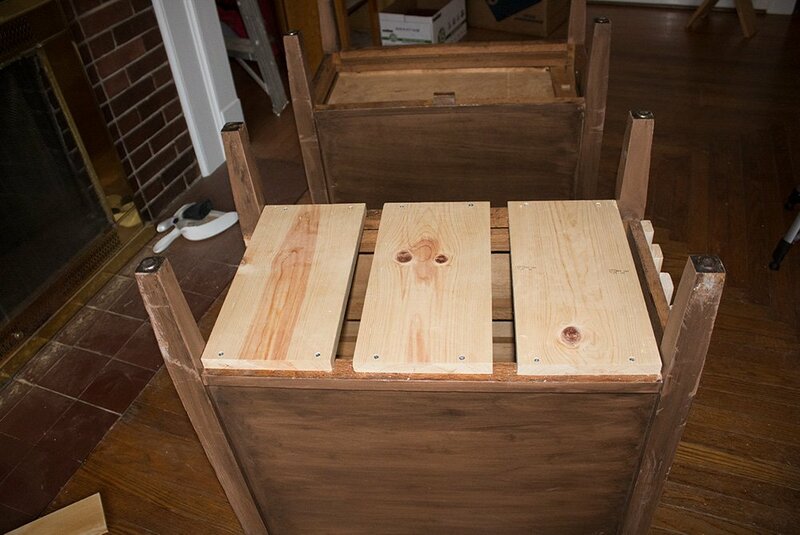 Then I added some scrap wood bars (with wood glue and screws) so that the space wasn't totally open. Note that I countersunk all the screws so that I could fill in the space with wood filler and they wouldn't be visible. Finally, I flipped the desk over and added scrap wood cut from a leftover 1"x 8" to the bottom to create a "floor" for the cupboard. 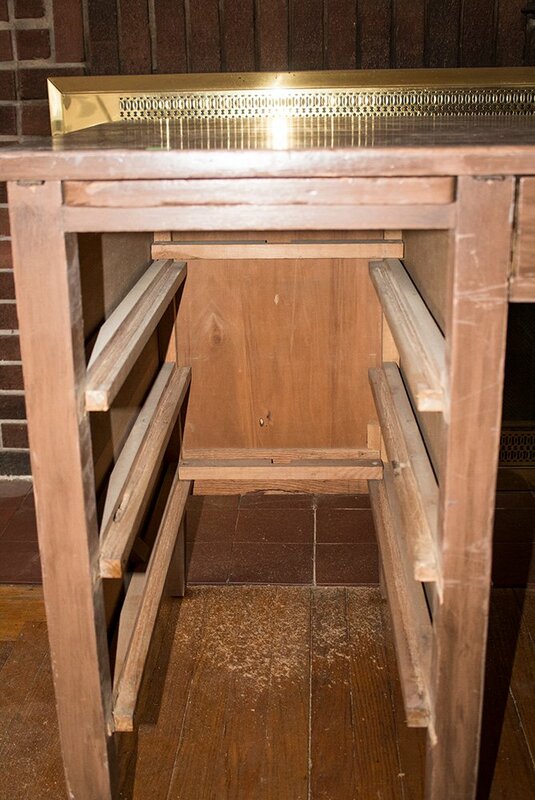 I used wood glue and screws to secure these pieces to the bottom of the desk. I also did a whole lot of measuring before I did this step to make sure my computer would fit in the space. Before adding "floor" of cabinet. You've probably noticed that there are spaces between the boards- this wasn't super thought out or or intentional, I was just too lazy to cut another piece, so I just spaced the three pieces I had out. You also might notice that my cupboard is currently door-less. There will be a door eventually, but I'll get to that later! The legs on this desk were almost 7 inches tall. I couldn't find molding that tall, so I added some 1/2" plywood to cover the space between the top of the molding and the bottom of the desk. 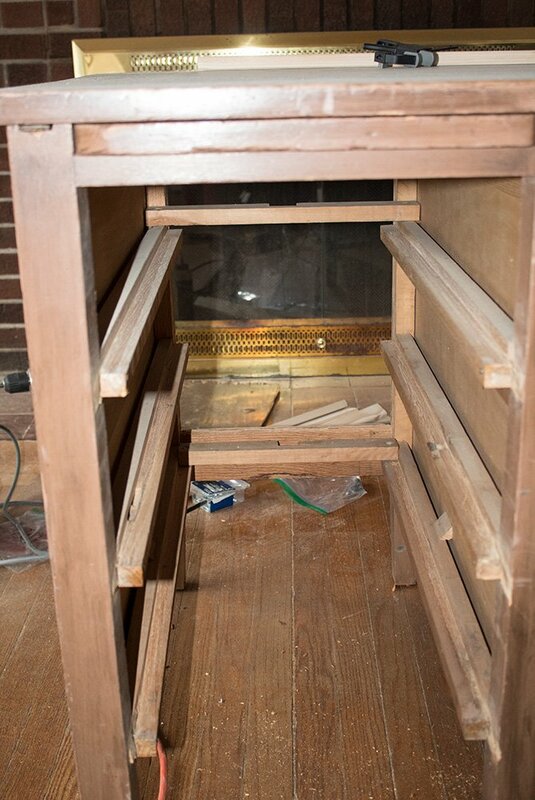 I secured this to the wood pieces I had already added to be the "floor" of the cabinet. I did this on both sides, I promise! Since I had to make a trip to Lowes to purchase the baseboard molding, I actually did the beadboard next. 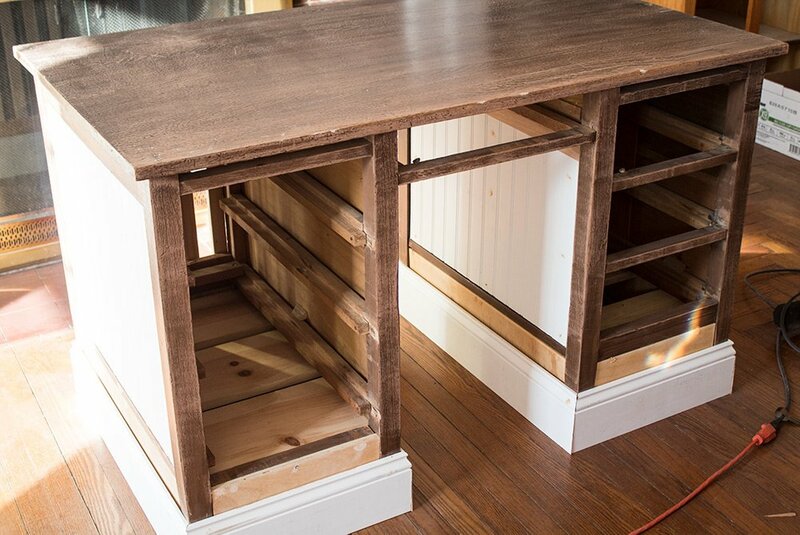 I had some leftover from the mudroom project, and simply cut it with a combo of my circular saw and miter saw to fit in the indented places on the sides of the desk. I secured the beadboard with wood glue and brad nails, using my awesome Ryobi Electric Nailer. Seriously the best thing ever- super versatile (I don't think there's a single project I haven't used it on) and easy to use. I was even raving to my friend about it at Thanksgiving, because clearly, everyone should own one. 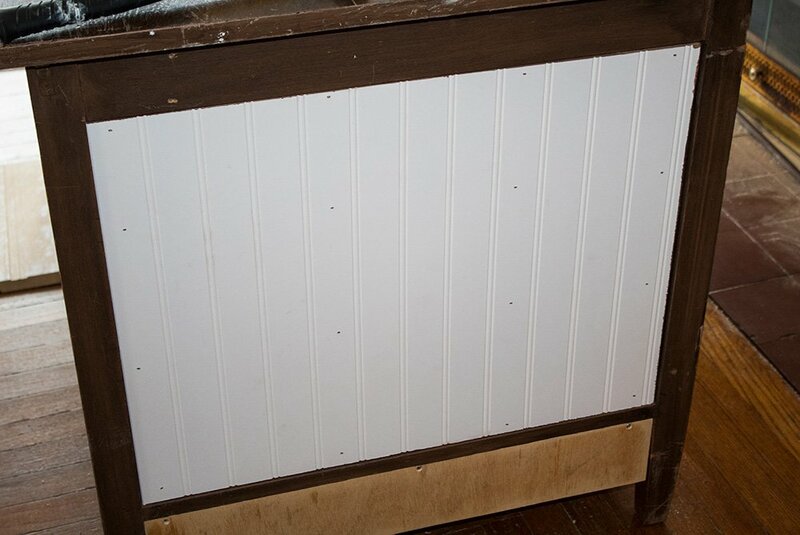 Once the beadboard was in place, I moved onto the baseboard molding. 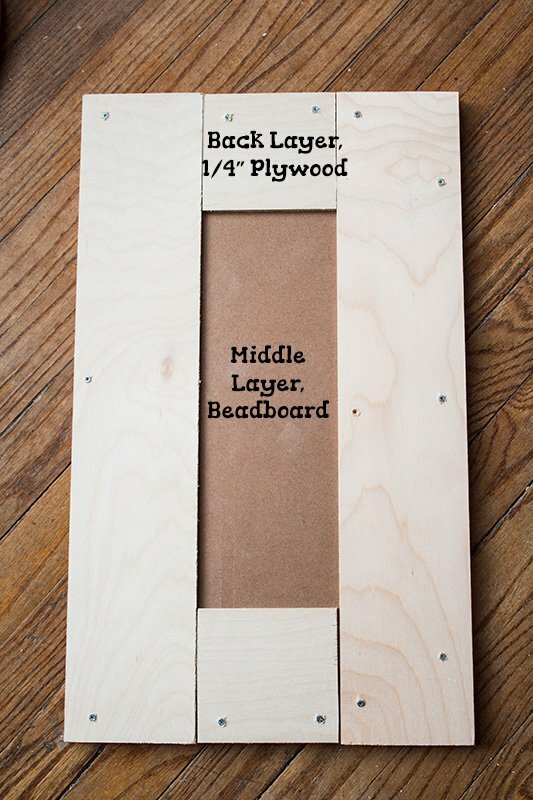 I purchased the tallest molding I could find (5 1/4", if you were curious) to wrap around the bottom of each sides. This was the biggest investment I made in the project, costing me around $25 for two 8 foot lengths. 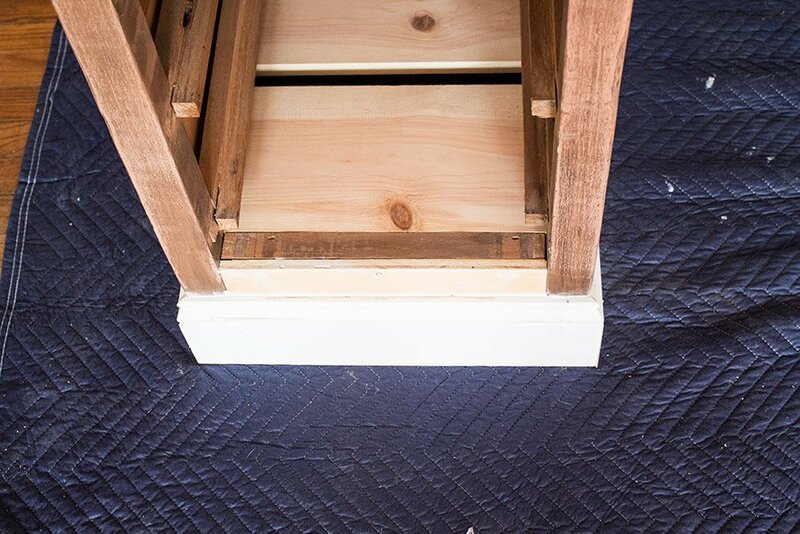 I am not at all a molding pro- maybe someday I'll get better and write a whole post on how to apply molding perfectly, but in the meantime, you should probably read somebody else's advise on applying molding. That being said, I'm pretty good at covering up all my bad corners with caulk, so I guess there's that. Since I hollowed out one of the sides of the desk, I needed to make a door to replace the drawers that were there before. 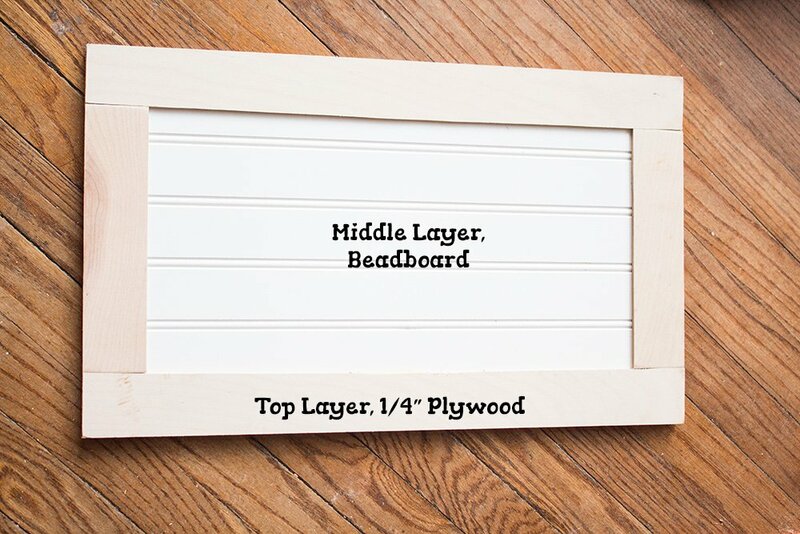 I wanted to keep with the beadboard theme, so I designed a three layer door. I had 4" wide 1/4" plywood strips left over from my kitchen floor project, so I used those combined with the beadboard to create my door. I attached it to the desk using these hinges that I special ordered from Home Depot. 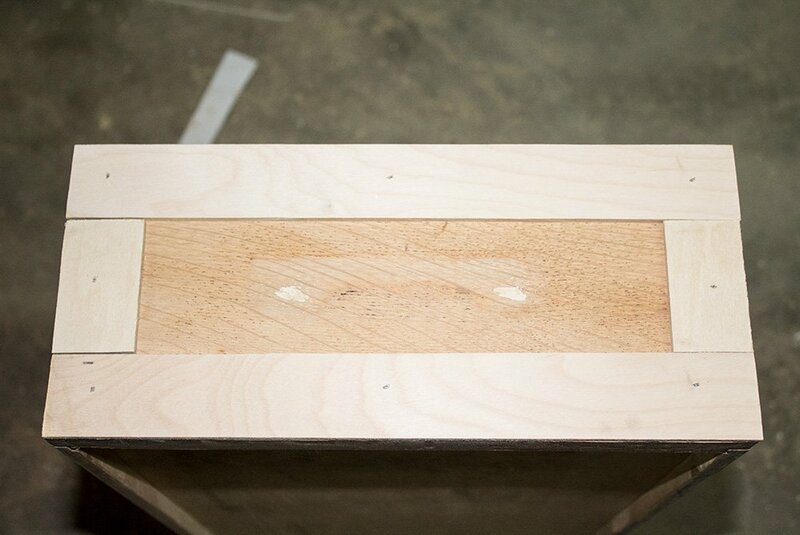 I struggled a bit to find hinges that I knew would work with this door since I wanted it to be inset style. 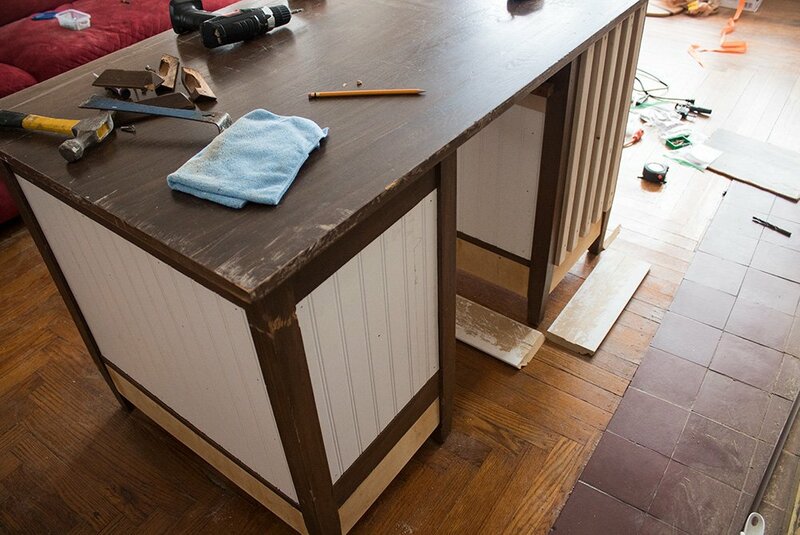 I glued on some a frame made from the 1/4" plywood, then painted so the drawers matched the rest of the desk. Before painting, I liberally applied wood filler to the desk. 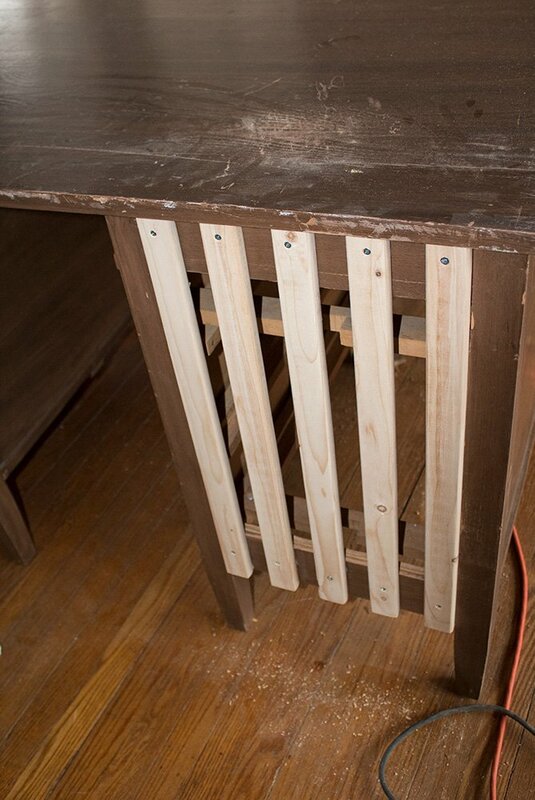 Any visible screws, brad nails, and damaged portions got filled with wood, then sanded back down. Caulk was applied anywhere there might have been a gap; behind the molding was the most significant spot. Then, the desk got a thorough sanding with my orbital sander. Finally, the desk could be painted. It got a coat of primer followed by two coats of latex paint. While I've seen chalk paint produce some gorgeous vintage-style pieces, I much prefer the semi-gloss finish of latex paint in my own home. As long as I prime and sand before painting, I've never had an issue using latex paint on furniture. It's so much better, right? And it has just the right amount of storage! It was definitely a bit time consuming of a project; I probably spent a 3-4 days working on it. But for less than $50 ($11.25 for the desk, $25 for the molding, and $10 for a half sheet of beadboard), I consider the time investment totally worth it! I'm so excited for my sunroom to be finished! Stay tuned for the upcoming posts about the other furniture I made in this room- a standing lamp and tilt-out trash can! 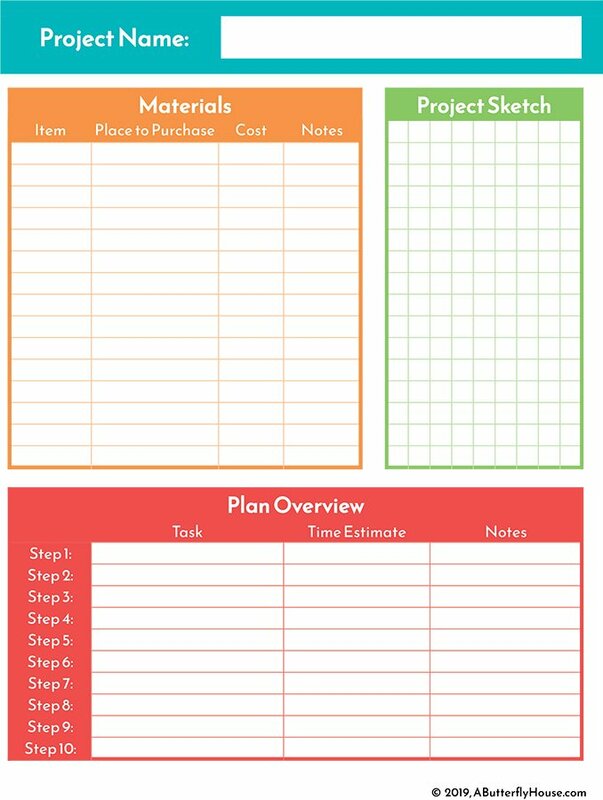 In the meantime, if you found this project inspiring, go ahead and pin it to Pinterest so you can find it later!